We’re happy to welcome a new development board in the Ubuntu family! 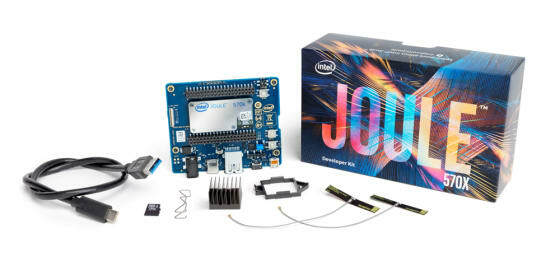 The new Intel® Joule™ is a powerful board targeted at IoT and robotics makers and runs Ubuntu for a smooth development experience. It’s also affordable and compact enough to be used in deployment, therefore Ubuntu Core can be installed to make any device it’s included in secure and up to date … wherever it is! Check out this Robot Demo that was filmed pre-IDF – The Turtlebot runs ROS on Ubuntu using the Intel® Joule™ board and Realsense camera. Ubuntu Core, also known as Snappy, is a stripped down version of Ubuntu, designed to run securely on autonomous machines, devices and other internet-connected digital things. From homes to drones, these devices are set to revolutionise many aspects of our lives, but they need an operating system that is different from that of traditional PCs. Learn more about Ubuntu Core here. Get involved in contributing to Ubuntu Core here.